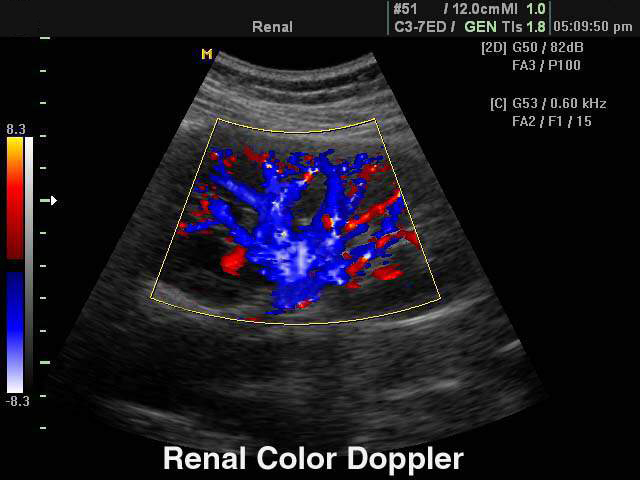 Why have a renal ultrasound? It can detect kidney stones, cysts, abnormal masses and obstruction of blood flow in the arteries and veins. The kidneys are important enough of an organ that nature gave us two of them. They play a key role in filtering waste from blood, balancing levels of electrolytes such a sodium and potassium, controlling blood pressure, balancing the acid in the body, and stimulating production of red blood cells. Located in the back of the abdomen, they are on each side of the spine. 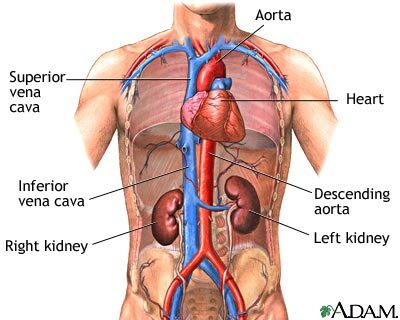 Blood is supplied from the aorta and it goes to the heart through the renal veins. Renal comes from the Latin word for kidney. Renal ultrasound is noninvasive, does not use radiation, and is painless. If an abnormality is found, a biopsy or intravenous pyelography may be ordered to determine the cause. Besides stones, kidney failure may also be detected. Kidney failure can occur because of many reasons. Most are from decreased blood flow through the organ. They can have low blood volume from blood loss, dehydration from vomiting, diarrhea, sweating or fever. It can be caused by poor intake of fluids, or from medications that cause excessive water loss ( diuretics ) such as "water pills". It can be caused from an obstruction such as a tumor or cyst. Renal failure can also be caused by damage to the kidney itself. It can occur because of poorly controlled diabetes, blood pressure, or chronic glomerulonephritis ( inflammation and scarring ). Kidney failure is permanent and the patient has to go on dialysis for the rest of his life. There are other, less common causes, but you should consult your doctor if you have an abnormal renal ultrasound. Back to ultrasound types.